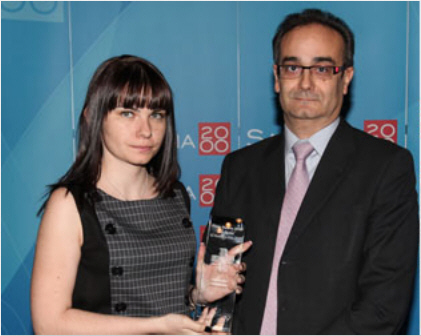 Horus has been awarded in the category of CONTRIBUTION TECHNOLOGY in the IV Premios de Sanitaria 2000 to the Sanidad de Castilla y León. Sanitaria 2000, the publisher of the newspaper including Redacción Médica, has celebrated this Thursday’s giving ceremony of IV Premios of Castile and Leon, which was chaired by the health minister, Antonio Sáez Aguado. The Minister stressed that with these awards, “is recognized the companies that represent the health of Castile and Leon”. “In addition, it has become a smart way because they have integrated innovation and commitment, and that is what characterizes our healing”. The winners in the 14 categories have received their awards from the hands of health care relevant personalities. Horus has received his prize from the hand of the Director General of Planning and Innovation of the Ministry of Health of Castilla and Leon, Rafael Sanchez, highly regarded person in Horus for his vision and effectiveness, which has given it to Catalina Abad Valencia, Horus project manager. This award recognizes the work of our company in the conduct of the Electronic Health Record of Castile and Leon, “Jimena”, reinforces our commitment to this project and demonstrates the worth of all people of Horus which since 2007 have contributed herein. We thank all the professionals from SACYL central services, from hospital computer services, from hospital medical services, and from other business partners, that have supported “Jimena” with their effort and dedication.